Chloraka has a small man-made beach which is popular with both visitors and locals, where the sea is marvellously clear, blue and inviting. The beach is protected by a breakwater that makes it a great swimming spot. For a major wow factor you can watch a gorgeous sunset over the sea while strolling along the scenic coastal path, if you can tear yourself away from the pool, your villa at Chloraka is an excellent base for exploring. You are right on a bus route – large, comfortable, air-conditioned buses run every 15 minutes from Coral Bay to Paphos harbour and town. You will soon understand why Paphos has been designated a World Heritage Site, as the whole area is so steeped in antiquity that you can hardly move for ancient ruins, tombs, mosaics, temples and churches, museums and basilicas! You don’t need to know much about history or architecture to appreciate the very special atmosphere here. When you return to Chloraka to relax in the evening, you have a good choice of restaurants, with staff who will make a huge fuss of any children in your party! (Your kids may forsake McDonalds’ forever - beware! )Our villas are just a short walk from resort amenities, bus stops and the beach of Chloraka. You will be only 15 minutes' drive away from the lively Coral Bay Strip and the scenic Paphos Harbour, which is 15 minutes away by car. Our villas Keti and Elenitsa sit in a private cul-de-sac and are just a short walk from resort amenities, bus stops and the beach of Chloraka. There is a small choice of mini markets for your daily essentials, with more choice in nearby Paphos and Coral Bay. The main Strip of Coral Bay has all the shops and retail outlets, selling everything from designer spectacles to jewellery, souvenirs and trinkets. Alternatively, the bustling town of Paphos is famous for its market and you can reach it by bus or car in around 10 minutes. It has a market which is set in a maze of lanes, selling an array of Cypriot fare, including local Cyprus linen and lace. There is also a farmer's market in the old town of Paphos. In Chloraka Centre you will find the church, surrounded by coffee shops where the village locals gather to drink coffee and play a friendly game of backgammon. There are also international restaurants and local tavernas in Chloraka Village. Alternatively, the nearby resort of Coral Bay caters for those seeking bars, cafes and restaurants. It is great if you want to sample Cypriot dishes in local tavernas or even if you are looking for international cuisine. A short drive uphill guides you to the heart of Peyia. There are several traditional tavernas, each serving excellent local dishes and drinks. Paphos is around 10 minutes’ drive away and has some very good restaurants, especially in the harbour and Old Town. Chloraka Beach has golden sands stretching across the coastline. There's an enclosed area that's protected by rocks, keeping the big waves at bay so your children can swim safely. Alternatively, Coral Bay Beach is 15 minutes' drive away, with sun loungers and parasols to hire. Head here if you’re looking for water sports thrills. If you’re a cat lover, Tala Monastery Cat Park is just 15 minutes’ drive away from Chloraka. It’s a sanctuary for cats, and the people who work here do a wonderful job providing a safe haven for these beautiful creatures. In the nearby Coral Bay resort, you can visit the Ithaki Amusement Park for a fun-filled family day out. Paphos Zoo, on the other hand, is a great place for all animal lovers. There are tigers, giraffes, tortoises and many other beautiful animals to see. There is also a bird show several times throughout the day. 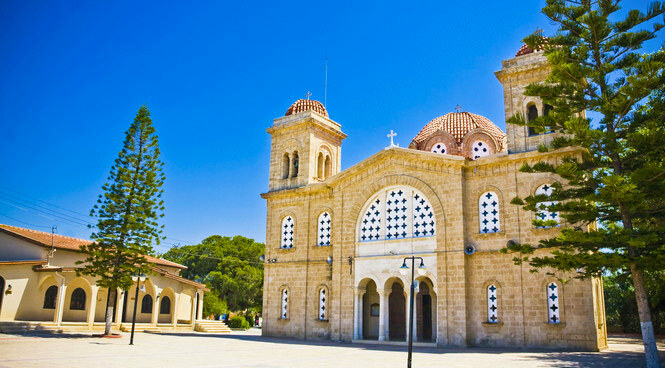 Paphos is around 15 minutes’ drive away and is well worth a visit. Head east for Paphos Old Town and its maze of narrow streets, or go to Kato Paphos (the harbour). This is home to some of the most intricate mosaics in the Eastern Mediterranean and has numerous activities to enjoy, including bars, restaurants and shops. Whilst on your Cyprus holiday, visit the Akamas Peninsular, which is the perfect place for a hiking trip – the view from the top is amazing!